Long Beach.—The Nisei Athletic Union’s 2012 Akira Komai Memorial Playoffs continued April 22, with Southern California finals in the Aye Minor and Aye Major divisions, as well as semi-finals in the Aye Plus and Double Aye sections. State finals for Aye Minor and Aye Major will be played Sunday at Rancho Dominguez Prep in Long Beach, with the first game at 10 a.m.
After the State finals, Aye Plus and Double Aye will hold their SoCal finals. There are no Northern California entries this year for the State title in those two divisions. No-Names had only two player score in double figures, but that was enough to take the Aye Minor Southern Cal title, 53-47, over Mortar Forkers. Jon Silva led the attack with 13 points for No-Names, who had nines steals and forced their opponents into 22 turnovers. Tom Ryono had a game-high 16 points for the Mortar Forkers. No-Names will play for the State Aye Minor championship Sunday, when they face the NorCal champs, East Bay Court Jesters. Game time at Rancho Dominguez Prep is 10 a.m.
Brahmon Graves was the man with the hot hand in the Aye Major SoCal final, scoring nearly half of Entourage’s 53 points. 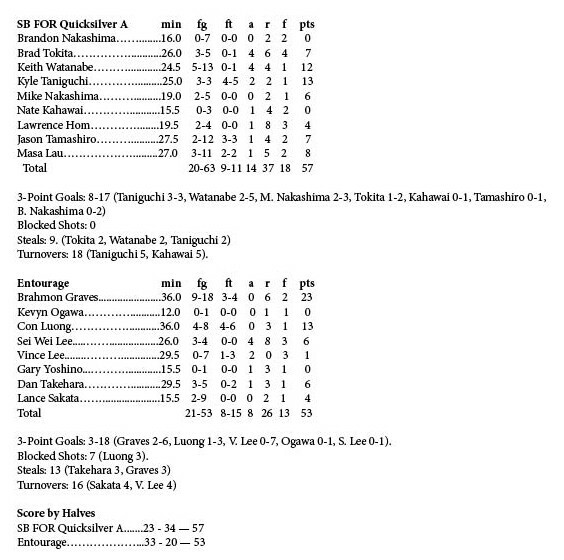 However, it was enough, as Kyle Taniguchi’s 13 led a balanced attack and South Bay FOR Quicksilver A came away with a four-point victory. 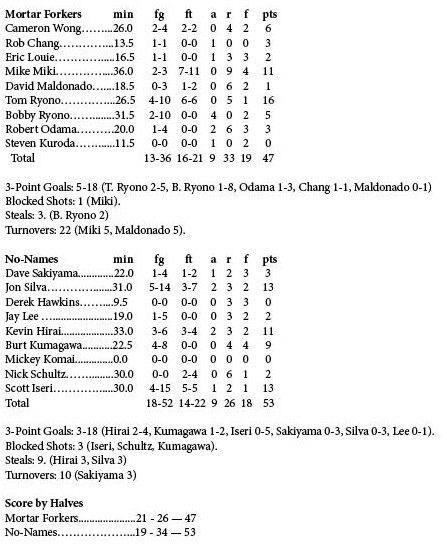 A key advantage for Quicksilver was their three-point shooting, hitting eight of 17 shots from beyond the arc, including three from Taniguchi. Entourage managed only three of 18 from long range. The South Bay club will vie for the state title Sunday when they take on the Sacramento Samurai at 11:45.